The red t-shirt is a big brother present but the rest of the goodies (a onesie, bib, luggage tag and two burpees) is for my girlfriend's newest little love, baby Oliver! Nothing fancy but hopefully she thinks its all pretty cute. Almost as cute as her adorable little boys! Almost. Hey, maybe y'all can help me out. I used to be able to move my photos around by clicking and dragging. Move them between paragraphs and such. But I can't now. I have no idea why. But it's annoying. How can I go back to moving around my pictures? If I can't figure this out I am going to have some very unexciting posts with only one or two pictures that are randomly placed at the top of the post. Are you Mac or PC?? I'm still new at this, so I don't know if this will help or not. I go to "edit html" and cut and paste the "photo" information where I want it. I think that it is WAY too much work, but I haven't figured out how to do it otherwise. Good luck and great blog! I LOVE the name Oliver!!!!!! I have the same problem with pictures and have no idea how to fix it...sorry!!! Those gifts are so cute! Oliver is one lucky little man. 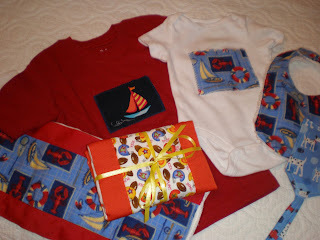 What a wonderful assortment of baby goodies!! I LOVE the red T-shirt...SO CUTE! Oooooh, Miss PPC, Baby Oliver is one lucky camper! They are *so* darn cute! This is so weird.... because we are struggling with image placement at Wordpress, which we otherwise love. It may just be that we are technically impaired, but we are seeing other people with the same issue in the forums. Technology.